climbed on May 6. 2017. Locate the small town of Stranda at Sunnmøre. 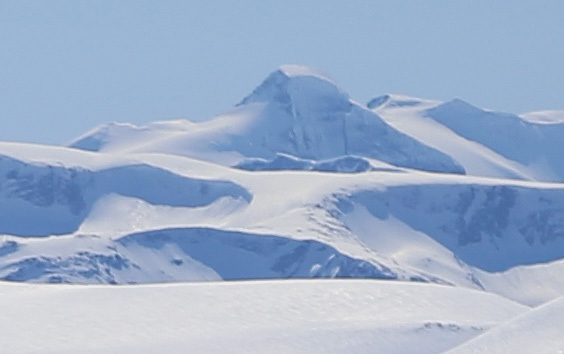 The next village on the south side of Norddalsfjorden, further east, is Eidsdal. From Stranda, you first need a ferry to the north side (Liabygda), then drive 10 kilometer east and take a second ferry across the fjord to the south side again. From Eidsdal drive a few kilometer east along the fjord to Norddal. 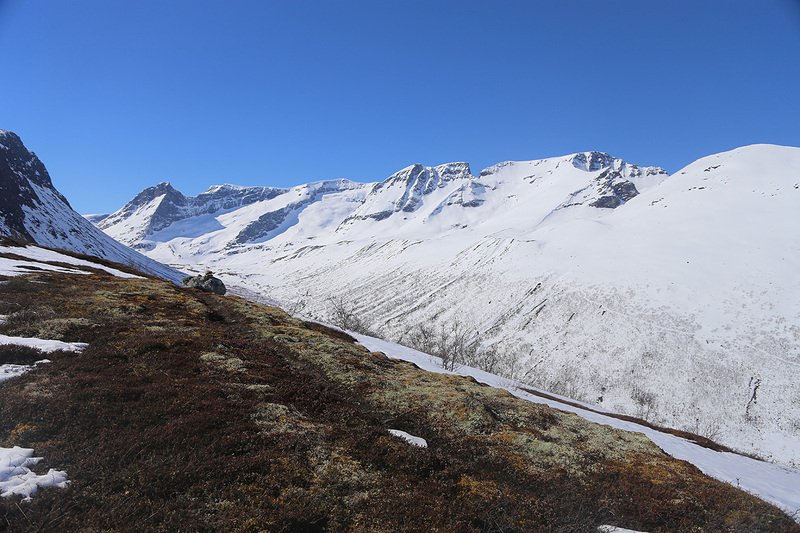 Drive into this valley, then locate the road that climbs west and actually crosses back over to Eidsdal. Do not continue up into the higher part of the main valley. In summer, it may be possible to drive all the way to the mountain farm area Rellingsætra. In winter and spring, one should park near location N62.24138, E007.23635, elevation about 300 meter. An old tractor road branches sharply left here and provides excellent access to Rellingsætra. From the trailhead, follow the tractor road on a very steady, but gentle uphill slope to the mountain farm area Rellingsæter. Cross the open fields while gradually descending slightly to reach the bridge located just below the Innsetsætra farmhouse. From Innsetsætra, there is a marked trail that very conveniently reaches the main crest. This location is at N62.22316, E007.26050, elevation 800 meter. Note that the trail first ascends south-east, then turns left and runs north to reach terrain that rises above the tree-line. In spring, depending on the snow cover, one may need to do this section on foot. There are no steep areas, but quite a few trees that may cause trouble if the snow cover is also limited. From here, the ascent is pretty straightforward. One can ascend the ridge running south to the summit. Skiing a bit on the left (east) side of the ridge may be convenient, then entering the main ridge at what appears like a distinct step (a short slightly steeper section), higher up. Continue ascending fairly gentle slopes until the summit is reached. There is a large, impressive cairn. I was visiting my friend Arnt this weekend and the plan called for climbing Torvløysa. We left from Arnt's place already 0500, two ferries along the way. Leaving the car at 0830, we started out following the tractor road to the mountain farm Rellingsæter. This took about 30 minutes. 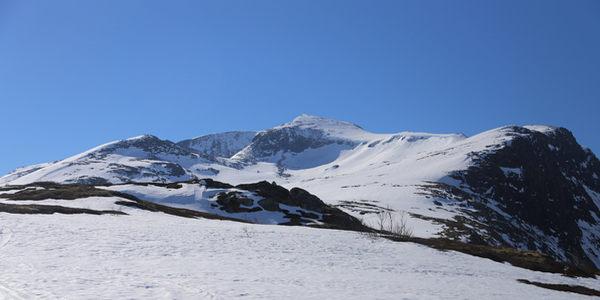 From there, we skied to the bridge and further passing the mountain farm Innsetsætra. Shortly uphill from there, skiing became rather awkvard due to the combination of trees and the lack of snow. Thus, we carried the skies up this rather nice route to near the top of the ridge. Quite impressive views back down across the local valley to our neigbors, the rugged peaks called Skorene. 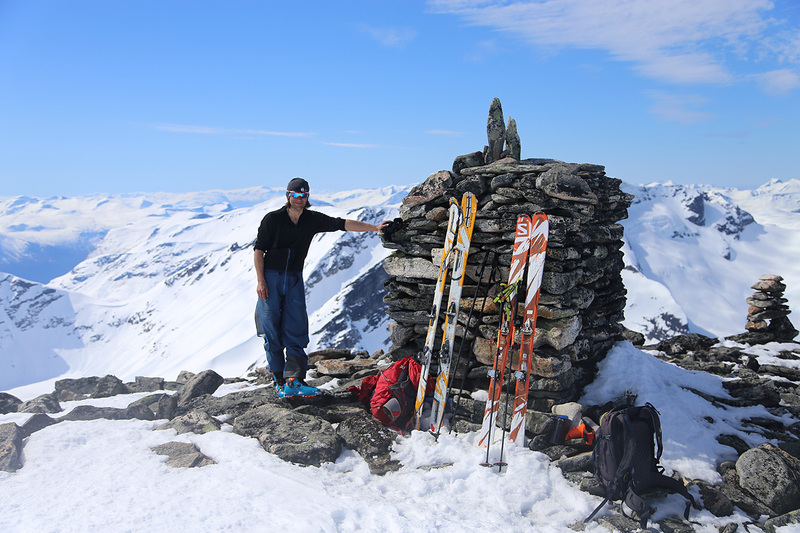 From here, skiing was indeed very nice and we reached the summit at 1315. The weather was absolutely gorgeous, completely calm and clear, almost too hot. I had packed away warm clothing a long way downhill and skied in my wool skirt only. We rested and took some lunch while looking at the scenery all around. Lodalskåpa clearly visible to the south. Leaving at 1350, we enjoyed good skiing, about 1000 vertical meter, before another carry down to Innsetsætra. We were back at the car by 1630, what remained was an easy drive back to Arnt where Anne and her friend had prepared a delicious dinner.